In what had to be one of the most anticipated reveals in motorcycle cruiser history, Polaris boldly used the backdrop of the world’s largest motorcycle rally to unleash the latest generation of Indians on the motorcycling community. On the steps of the Sturgis Motorcycle Museum and in the shadow of the Black Hills, notice was served with a loud and clear report: Indian Motorcycle is back. As with all great expectations, the risk of anticlimax is real. But after spending a few days aboard the newest American cruiser, two things are as clear as a Sioux war cry: One, when it comes to disappointing its purists, Indian has no reason to worry; and two, that little motorcycle company in Wisconsin had better get busy acknowledging that it just might have a border war on its hands. Truth be told, Harley-Davidson never really considered Polaris’ other motorcycle company, Victory, to be much of a serious threat. As a start-up, Victory faced the usual assortment of obstacles and hiccups, and besides, how do you compete with an icon? Polaris has found an answer: with another icon. American Picker Mike Wolfe at the Indian Motorcycle plant in Spirit Lake, IA. Indian released three new motorcycles last week in Sturgis: from left, the $22,999 Chieftain, the $18,999 Chief Classic and the $20,999 Chief Vintage. The new Indian’s tag line is “Choice is Here in American Motorcycles,” and with the three 2014 models coming in at a price point far below what experts (and even Indian insiders) initially predicted, it’s the truth. With the naked Chief Classic ($18,999), the soft-bagged Chief Vintage ($20,999) and the faired Chieftain bagger ($22,999) arriving in dealerships in September, Indian Motorcycle is poised to leapfrog its own sister company and immediately compete with the Motor Company for the hearts and minds — and dollars — of American V-Twin cruiser riders the world over. I was joined at the reveal by Editor in Chief, Kevin Duke, and his recent report outlined the development of the new Indians and the technical details that went into reinventing the brand. For my part, I’ll focus on the ride experience these new cruisers provide. The comparatively unadorned Classic is the lightest bike in the line, and while its fender skirts might be polarizing, there’s no denying they’re a trademark of the Indian brand, and it’s great to see them resurrected. There’s no need to carry on extensively about the differences between the Classic and the Vintage; both are Indian Chiefs, and are distinguished only by design flourishes. The Vintage features a tan leather seat, matching leather saddlebags and a windshield, while the Classic is subtler, with a fringeless (although studded) black leather seat and trademark fender skirts. There are other differences as well, such as the tank badging: the Classic has the Indian script logo painted on, while the Vintage features the logo on a metal badge. Both have a nostalgic, tank-mounted speedometer with a retro sepia face to augment the copious chrome and a small scrollable LCD display that provides vital info, including a gear-position indicator and digital tach — a nice modern juxtaposition to the throwback appearance. The Vintage, meanwhile, gets snooty chrome fender tips and enough tassels to dry-mop an airplane hangar. Otherwise, the Classic and Vintage share components, ergonomics and architecture. The Vintage is still a Chief, albeit with a tall windshield and tan leather that make it a natural competitor for Harley-Davidson’s Heritage Softail Classic. The Vintage’s saddlebags utilize plastic tongue clip-latches hidden behind large, functional buckles. Those tongue clips might be the only plastic bits to be found anywhere on any of these bikes, but even they are (comically) plasti-chromed. 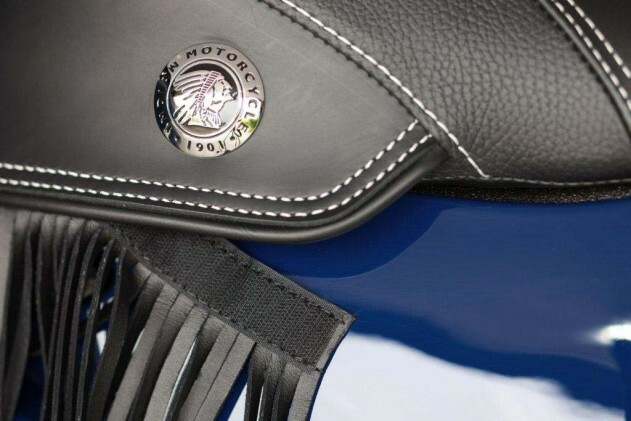 Best of all, the supple leather matches that of the fringed, super-comfy saddle; it looks like butter, and feels like it, too. Like the windscreen, the bags are also of the quick-detach variety.The differences between the Classic and Vintage lie in the protection the Vintage’s tall windscreen provides (I’m 5’11”, and it terminated well above my line of sight) and the cargo capacity delivered by its soft leather saddlebags. The windscreen pops off in seconds, without tools, so if you’re in the mood to feel the wind in your face it’s a quickly achievable sensation. And here’s a tidbit of tantalizing info: Indian reps assured us that the hard molded bags found on the Chieftain, which are slightly deeper because they rest rubber-mounted on the pipes, could surely be deployed on a Vintage, with only minor modifications. 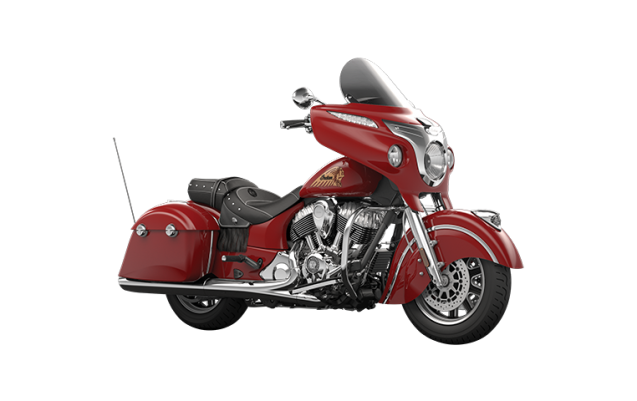 The Chieftain, Indian’s new hard-bagger, features a bar-mounted fairing with a pointed chrome nose that recalls the streamliner trains of the 1950s. Two analog gauges track speed and rpm, while a central LCD readout provides all the info a touring rider could want, including a tire pressure monitor (standard). Also encased in the dash is a 100-watt audio system that provides surprisingly crisp sound, and a nook for your iPod, iPhone or whatever you want to pair the audio system to using Bluetooth. Make no mistake: the Chieftain’s fairing is distinctive, and probably not for everyone. Kudos to Indian for taking a risk on what’s likely to be a polarizing feature on an otherwise undeniably excellent motorcycle. For load-carrying reasons, the Chieftain trades its brothers’ spoke wheels and whitewall tires for cast hoops and blackwalls. It was interesting to learn that in its rich history Indian had never built a faired motorcycle, and in our opinion, Polaris/Indian designers could have found far worse inspiration for the Chieftain’s fairing. 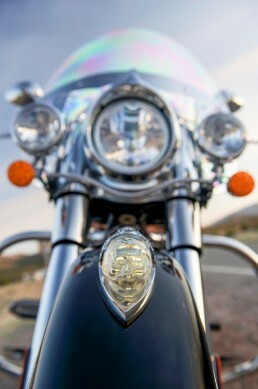 Where the old war bonnet had slightly downcast eyes, the new Indian’s eyes are forward and focused on the road ahead. All three Chiefs utilize the same Thunder Stroke 111 V-Twin and promise 119 ft-lb of torque at the crankshaft. All make use of spring-mounted floating floorboards; and all feature the trademark Indian war bonnet running light on the front fender. But wait, there’s more! 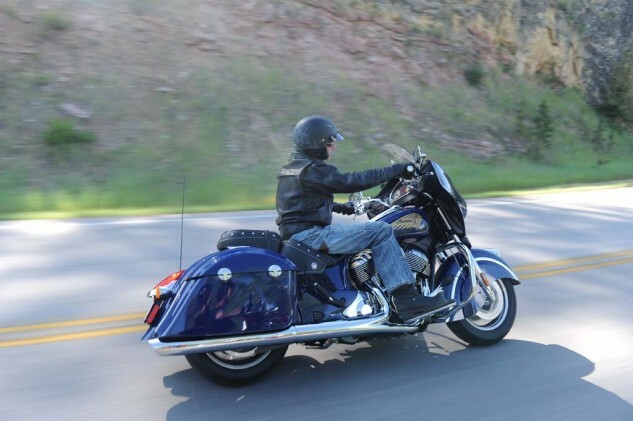 All three Indians use dual four-piston floating 300mm disc front brakes paired with another 300mm disc out back. And they all feature internally wired handlebars, keyless ignition, ride-by-wire throttle, cruise control and ABS as standard equipment. The Classic and Vintage sport an elevated, pull-back handlebar that places its grips higher and closer than what cruiser riders are generally used to, providing a comfortable upright riding position that puts most of the turning torque in the pilot’s upper body. The Chieftain’s handlebar, meanwhile, is rotated down to make room for the fairing. Which brings us to our first rave. 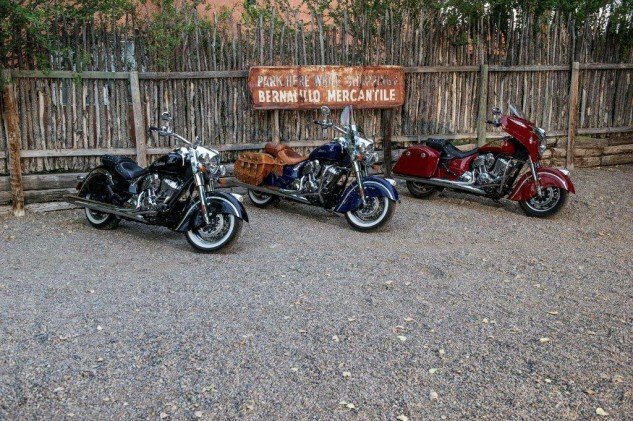 While shoulder-oriented turning could be problematic on most other heavyweight cruisers, these bikes make use of their aluminum-cast frame to dive into corners with nary a bow or flex, despite hefty tank-empty weights (778 pounds for the Classic, 801 for the Vintage, 815 for the Chieftain). The result? Surprisingly – no, astonishingly – nimble cornering, even when ridden aggressively. And the cornering clearance is immense. Scraping pegs, er, floorboards, took serious effort, way more than what was necessary to throw the bikes around with aplomb. Add it all up, and you get heavyweight cruisers that relish sporty riding. Even the most jaded of moto-journos were blown away at how well these bikes handled the curvy stuff. “I kept digging deeper in turns without touching anything down,” said noted knee-dragger Duke. All three new Indians are extraordinarily dexterous in the twisties. Credit the aluminum frame, credit the rangy power band, credit the high bars — credit whatever you’d like, because there’s plenty to go around. 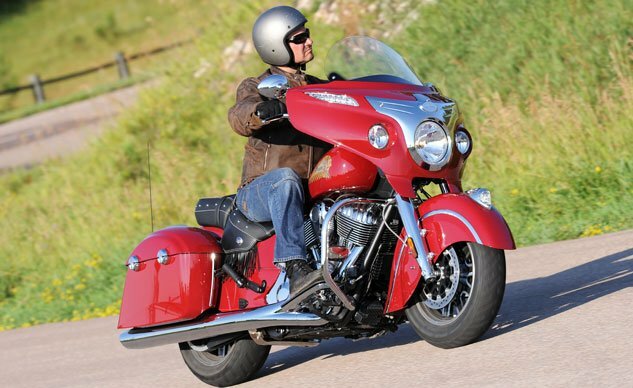 Fact is, each of the 2014 Indians provide solid and competent handling. The lower, further forward grip position belies the Chieftain’s stated purpose, but its slightly more aggressive riding position combines with its dimensional specs to provide an even sportier ride than that of its brethren. And it’s not really very close. The larger and heavier Chieftain feels smaller, lighter and nimbler on the blacktop than either the Classic or the Vintage, and the reason sits front and center. The Chieftain employs a 25-degree rake, as opposed to the 29-degree rake of the non-faired Indians. That sharper incline translates to a wheelbase of 65.7 inches, significantly shorter than the Classic and Vintage’s 68.1. Combine that with a pneumatically adjustable rear mono-shock and you’ve got a motorcycle that not only looks better than most of the other bikes in its segment, but one that flat outperforms any other heavyweight bagger on the market. Bar none. This may be the best handling, best performing tourer this rider/writer has ever had the pleasure to ride or write about. It’s that freakin’ good. Unfortunately, slow-speed maneuvering on the Classic and Vintage holds no such mind-blowing charms. It’s admittedly easy to suffer a letdown after setting such a high standard in the twisties, but U-turns and parking lot choreography on these two cruisers proved relatively ponderous, thanks to their considerable weight and what felt like a subpar turning radius. Perhaps we were just spoiled after being astounded at their agility on Black Hills two-laners. True, the 26-inch seat height and easy clutch action make it a breeze to power-walk all three of these bikes anywhere you need to put them. And it should be noted the Chieftain’s shorter wheelbase made its slow-speed maneuvering comparatively easy. But our advice? If you opt for either the Vintage or Classic, don’t bother ponying up for the accessory beach bars. You’ve pretty much already got them. Braking is fine, although Duke lamented the lack of feedback. I found them grippy, not grabby; lightly dragging the rear brake enabled shame-free low-speed turns that would make the Motorman proud. During the annual Legends Ride, I found keeping big Vintage upright via the slow-speed tango of clutch, brake and throttle as effortless as can be expected of a bike this size. The linked ABS isn’t overwhelming when put to the test — just a series of gentle nudges to let you know you might be heading for deep crap if not for its input. In the cockpit, the hand and foot controls on all the Indians are intuitive, effortless. The rubber foot petals are easy to find but don’t get in the way of the capacious floorboards. “The long floorboards allow a variety of leg positions,” Duke noted, “from stretched-out forward to nearly a standard-bike location.” The cool dogleg hand levers are easy to reach and actuate, and the simple teardrop rear view mirrors provide plenty of backside feedback. Even with the standard cruise control, neither handgrip on any of these bikes sports a massive console with a confusing plethora of buttons, nor a dangling control box seemingly bolted on as an afterthought. On the Indian’s chrome headstock, everything’s tightly packaged but tactilely discernible. The black buttons stand out from the chrome, and even gloved thumbs readily find and actuate the appropriate buttons. Remarkably, the same is true on the tech-laden Chieftain. The right grip is identical to the Chiefs’, with two buttons operating the cruise control functions. Its left grip, though, has a large, round rubber button below the turn signal; akin to the one on your TV’s remote control – pushing it on the top, bottom or to the sides controls the various audio functions. It also has separate buttons for audio mode (Bluetooth enabling, WX/AM/FM, iPod, etc.) and for controlling the electrically adjustable windscreen – a first in a bar-mounted fairing. But again, none of this is ungainly or even too confusing while riding once you get the hang of it. Indian has kept its tech control package snug, instinctive and tactilely pleasing. Back to the road, the ride-by-wire throttle provided what Duke called “impeccable response, without any abruptness whatsoever,” and the cruise control, which activates only in gears above third, is never herky-jerky; just a flick of the thumb and the ACC and DEC buttons gently increase or decrease speed about 3 mph — ideal for minor pace adjustments and random cop sightings. 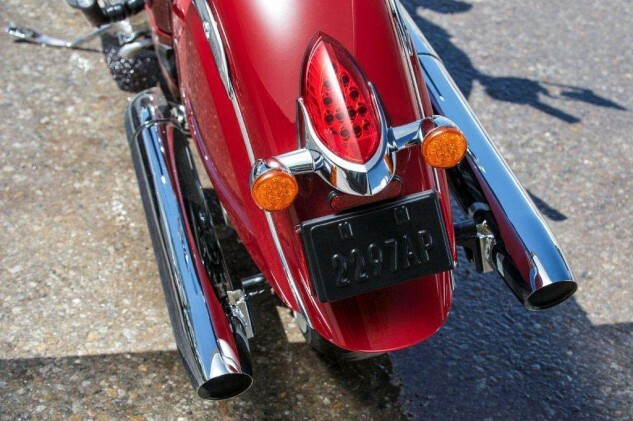 All three bikes feature trademark Indian dual-sided exhaust pipes that provide a superb, supple rumble that develops into a throaty roar at speed. “The exhaust is quiet at low revs, but ramps up to a sweet, deep baritone,” Duke noted. Now for the ultimate rave. From a stop, the Thunder Stroke pulls with confident, laconic ease, all the way up into sixth gear and cruising speed. Duke and I agree that Indian’s heat management is superior to Harley-Davidson’s, thanks to ceramic-coated headers, exhaust shield and dual-layer valve covers, although it should be said after three hours of tooling I felt quite a bit of heat behind my left knee. Still, that shouldn’t be a deal-breaker. The T-stroke is more than just a beautifully sculpted piece of industrial art; it’s a superb machine that performs flawlessly. On a motorcycle full of top-notch components and features, the Thunder Stroke 111 is perhaps its most exquisite. All three new Indians are cut from the same cloth. We can safely say we preferred the faired Chieftain, but it’s clear that America’s first motorcycle company has been reborn. This time should be the last time. All three motorcycles exhibit superb handling, excellent fit and finish, outstanding performance and classic design. 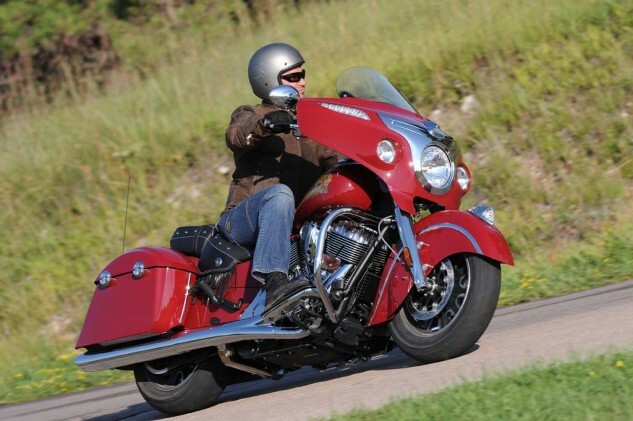 The 2014 Indians are the complete package, a perfect blend of form and function that are sure to have the R&D departments of all other American V-Twin manufacturers – Victory included – scrambling back to the drawing board. See our full gallery of images here. 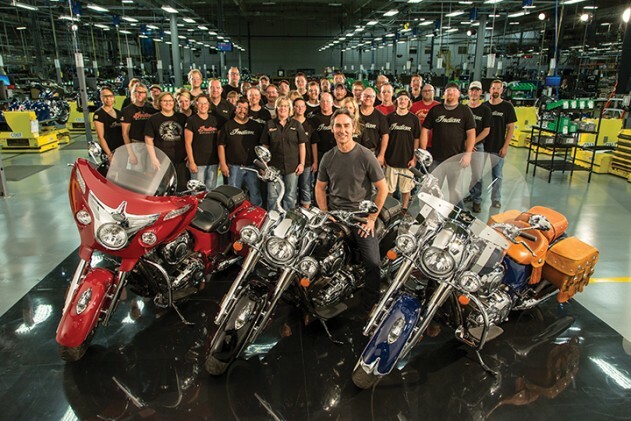 Indian Versus Harley-Davidson: More For the Money? 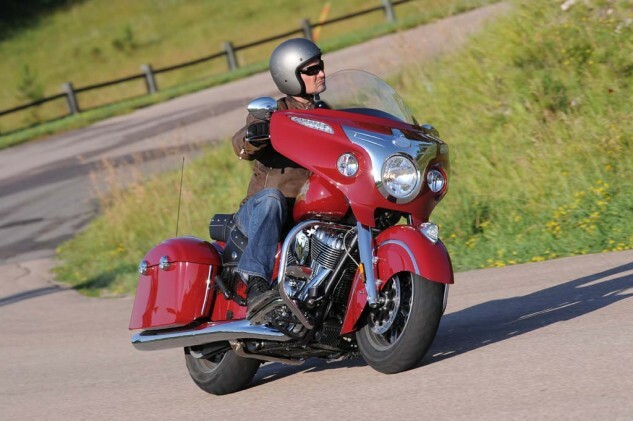 As mentioned at the top of this story, the price point Polaris was able to achieve with the 2014 Indians was not only eye-opening for motorcyclists; it took even some learned insiders by surprise. Sure, off the showroom floor these models cost the same or even more than their direct competition, but for the consumer to get comparably equipped Harley-Davidsons – and in some cases, that’s simply not possible – they would end up paying more money. Consider first the Thunder Stroke 111 engine. With its claimed 119 ft-lb of torque, it’s far more powerful than Harley-Davidson’s Twin Cam 103 used in most of its Big Twins. 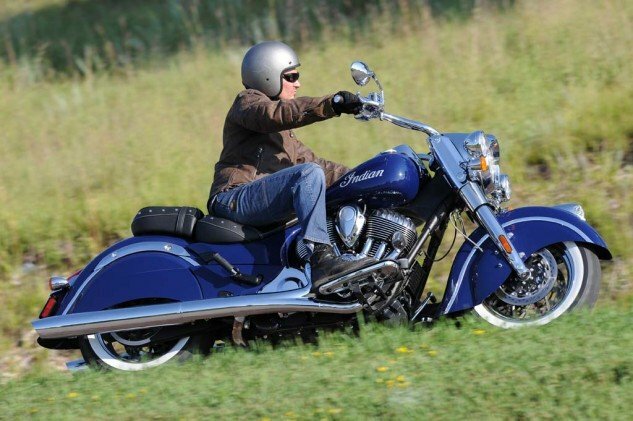 Now take into account that the new Indians all offer as standard equipment internal handlebar wiring, keyless ignition, chrome forks and hand/foot controls, cruise control and anti-lock brakes. Got all that straight? Great – let’s shop baggers. 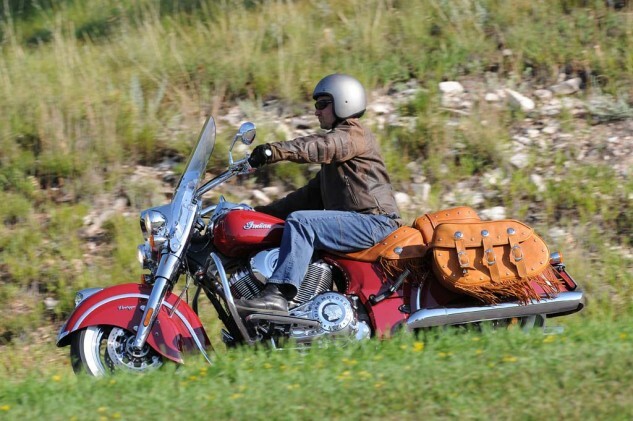 The prime target for the Indian Chief Vintage, with its soft bags and windshield, is Harley’s Heritage Softail Classic. Although similarly styled, at $20,999 the MSRP of the Vintage sits $3,400 more than the Heritage, due to all the above-mentioned features. However, the cost of upgrading the Harley with comparable features will cost thousands. ABS requires $1,195 for the Security Package, which includes the key fob that stops your Harley from starting but won’t let you start it without the key. If you’d like cruise control, you’re out of luck – it’s not an option. The Chief Vintage comes with leather seat and bags, as well as chrome forks and hand and foot controls – all available farkle options on the Harley that will also cost well over $1000 by the time you’re done. Finally, the Thunder Stroke 111 pounds out 20 ft-lb more torque than the Harley’s Twin Cam 103. To get the Twin Cam anywhere near the kind of output the Indian makes, you’re looking at upgrading to the Twin Cam 110, which will add up to about $5K by the time you install the big-bore kit, new exhaust and intake, etc. 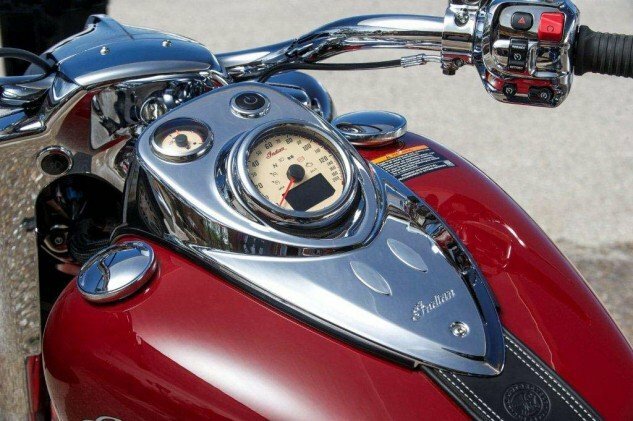 Your comparable Heritage Softail Classic now costs in the neighborhood of $25K. The new Chieftain has the best-selling motorcycle in North America – Harley’s Street Glide – dead in its sights, but at $22,999 costs $3,200 more off the floor than the Street Glide. However, the Chieftain’s power windshield and internal wiring aren’t even available from the Motor Company. A leather seat will cost about 600 bucks. ABS? Again, you’d need the $1,195 Security Package, which doesn’t provide the Indian’s Tire Pressure Monitoring System, keyless ignition, or Bluetooth enabling. Cruise Control? Sorry, that’s another option. Chrome hand and foot controls and forks? Sure! You can pick those three items up from the H-D catalog for about $1,300. Now the two bikes are in the same ballpark, about a hundred bucks apart. Oh, shoot – we almost forgot. The Street Glide uses the Twin Cam 103 engine, which is underpowered next to the Chief’s Thunder Stroke 111. You’re welcome to soup that up for about five grand extra. 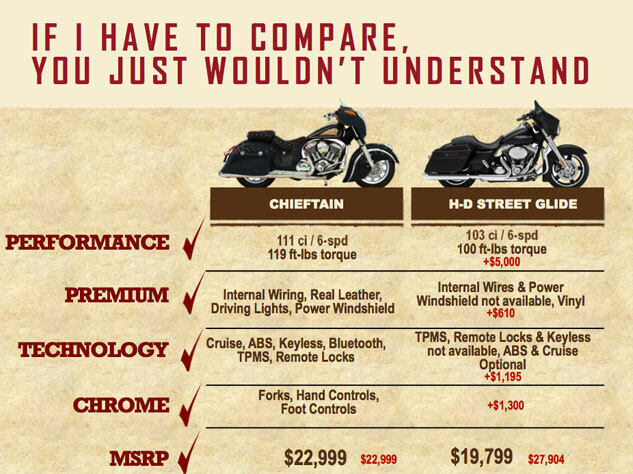 The TC110-equipped CVO Street Glide retails for $32,699, nearly $10K more than the Chieftain.